The Stereoping Synth Controller is a small studio tool which will be connected with your music synthesizer to allow editing it’s extensive world of parameters conveniently in realtime. 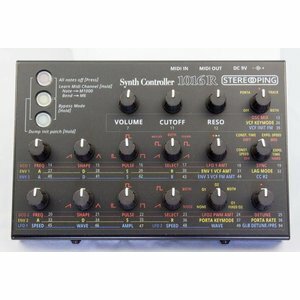 Instead of struggling with the synth’s built in cumbersome edit-interface, the Stereoping Synth Controller offers 16 dial pots and 3 lighted buttons to shape the sound interactively. 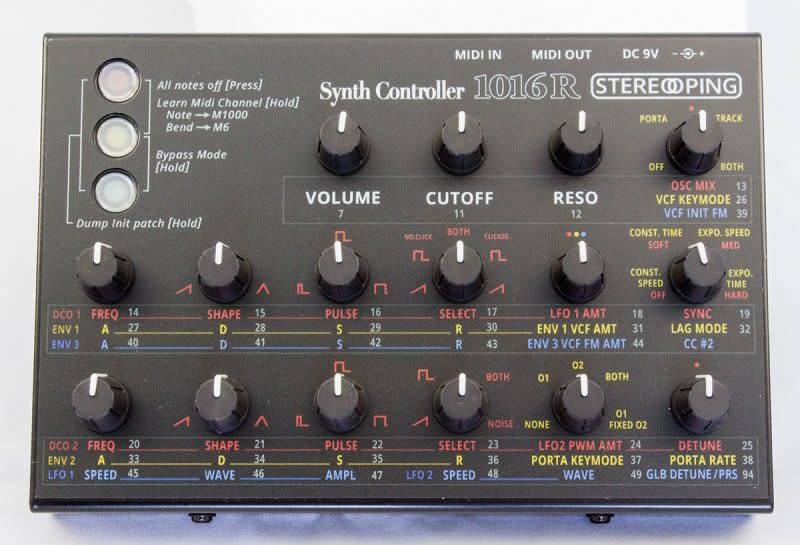 The Stereoping Synth Controller simply will be plugged in between the device sending mididata (Midi Output of your keyboard/DAW) and your synthesizer (Midi In jack). Incoming data from your sequencer (e.g. notes, pitchbend …) will be merged in the Synth Controller with it’s own commands and sent to the synth all together. You can tweak the knobs while your synth is fired by notes from the sequencer – realtime.